. . . you get more than you give. 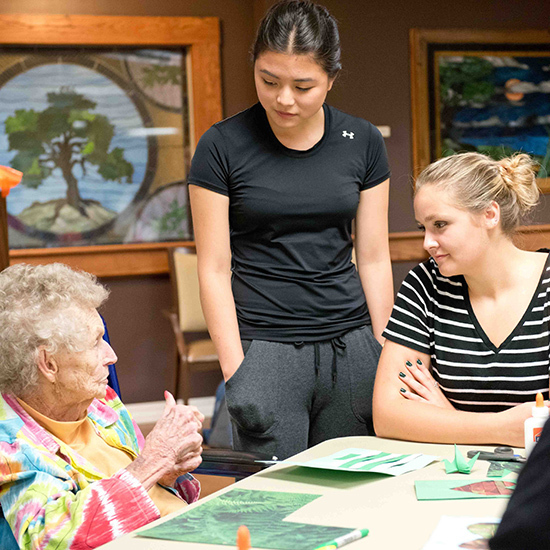 “I really enjoy going to the nursing home with Anchor,” says Bethany Lisowski (Luther HS / St. Matthew-Winona MN, pictured in the striped shirt). Anchor, one of many MLC student organizations, is dedicated to gospel-motivated service. Meetings are held once a week, and students can sign up to help with activities. “We usually do a craft with the nursing home residents, chat a bit, and sing a few hymns. They’re all such special people with interesting stories to tell, and it’s always a treat to be able to spend even a few hours making new friends with them. https://mlc-wels.edu/admissions/wp-content/uploads/sites/23/2018/08/ANCHOR-Sept-17-visit.jpg 550 550 Leah Matzke https://mlc-wels.edu/wp-content/themes/mlc/images/mlc-logo.png Leah Matzke2018-08-28 19:34:392018-08-28 20:47:57. . . you get more than you give.
. . . you travel 2,000 miles to tell little kids Jesus is their hero. . . . you hear where you’re assigned on Call Day.